There is something incredibly satisfying and strangely idyllic about seeing a tray full of cookies cooling next to a window. A picture immediately springs to mind of a middle aged, jolly, plump housewife in an old fashioned English cottage with a thatched roof and yellow door, pulling a pan of generously proportioned and puffed up golden brown cookies from the oven with a pair of blue-and-white checkered oven mitts and setting them next to the window to cool, so that the surface of each cookie is burnished with warm sunshine. Of course, my own setting is nowhere near as romantic. I am no jolly housewife and instead of a quaint English home, it is a cramped unit in a buzzing Sydney suburb where the oven door opens just slightly short to the width of the kitchen, where there is barely room next to the window to fit a baking tray and on the counter there is a green-and-white checked tea cloth instead of oven mitts. But the important part, of course, are the cookies - and these Saffron Vanilla Snickerdoodles are well worth it whether baked in your tiny city apartment or in an English countryside. The flavor is established through steeping ground saffron and a vanilla bean in some warm milk, which turns the mixture a cheerful sunny color that is generously studded with vanilla bean seeds. The milk mixture is then added to a pretty typical snickerdoodle dough. Aside from the fact that these aren't rolled in sugar before they're baked, they are like a traditional snickerdoodle in every other way - baking up highly puffed but buckling with a slightly gooey undercooked center. It's possible to make these even more traditional by rolling it in some vanilla sugar before baking, but make sure in that case to lower the sugar amount in the cookie dough first or it will be much too sweet. I had several disasters incidents in the kitchen while making these. Then I spilled half the jar of brown sugar on the ground. And then I thought my camera - which is not actually mine but my dad's - broke and had a mild-scale panic. It refused to turn on for a full five minutes until I took the battery out, said a fervent prayer and reinserted it. I suppose, though, it was mostly my fault. I was baking in a hurry. I was in a hurry so I could get some work done, but I had started baking in the first place to procrastinate. My life often confuses me. 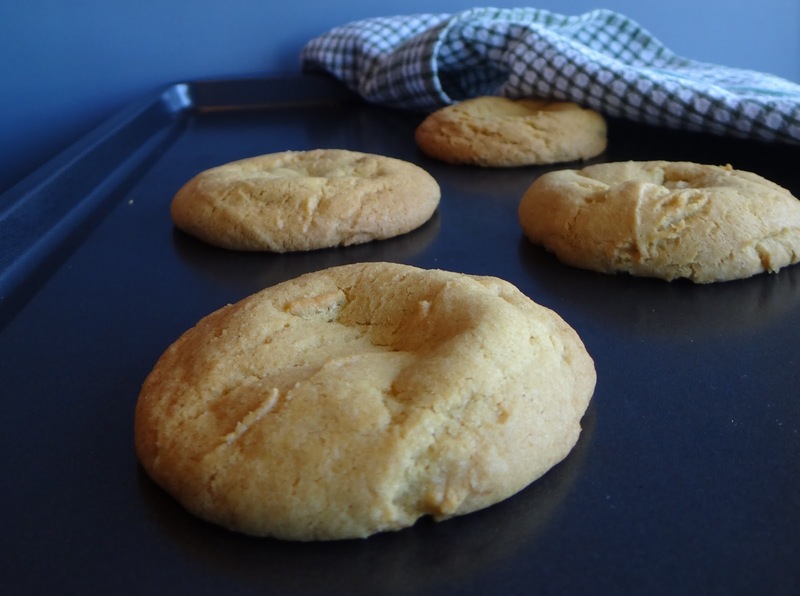 The point is, even with all of the things that could have gone wrong with making these cookies, they still came out of the oven looking rounded and perfect and smelling divine. These are easy to make, folks. I'll just be cleaning up those brown sugar crumbs now. Note: these are some of the softest, chewiest cookies I've ever had. If you're looking for a fat and fluffy cookie, then this is where you should stop. If the saffron-vanilla combination scares you, or if you're a broke uni student, try using this recipe for regular chocolate chip cookies by taking out the saffron and vanilla bean and replacing it with about a cup of chocolate chips (or whatever else you like) instead, because this cookie base is quite wonderful. Grind fresh saffron threads until powdery, enough to make 1/8 tsp of ground saffron. Alternatively, you can also chop them up finely - the finer the mixture the stronger the taste. Split the vanilla bean in half and scrape out the seeds, adding the pod, seeds, milk and saffron to a small saucepan and heating gently. (If using vanilla bean paste, put it into the milk in place of the vanilla bean.) Heat the milk over a low heat until it just starts to simmer; turn off the heat and set to one side to steep. Meanwhile, whisk together flour and baking soda in a small bowl. Set aside. In a large bowl (or a bowl of a stand mixer), beat the butter until smooth. Add the sugars and salt and beat until light and fluffy. Remove vanilla pod from milk. In a measuring jug (or another small bowl, if you're inclined to do more washing up), combine the milk mixture, egg and vanilla extract and whisk vigorously until it's well blended. Slowly stream this egg-milk-vanilla mixture into the butter and sugar, beating it in as you go, and mixing until well incorporated. Add the flour mixture and beat until a dough is formed. Wrap the dough in plastic warp and place in the fridge for at least 3 hours (or up to 5 days). Preheat the oven to 350F/175C. Line a baking sheet with baking paper. Using an ice cream scoop, portion out the dough evenly onto the sheet, spacing them about 2 inches apart. Bake for 16 minutes, turning the pan halfway, until cookies are golden and puffed. They should buckle in the center when they come out of the oven. Cool cookies on a wire rack - but not too long, these are lovely eaten warm. I saw these cookies on another site and was interested in them right away as I've always been intrigued by saffron. I'm glad to hear that they were great. It's nice when cookies can transport you, if only for a moment, to a whole different world. These were awesome, you should definitely try them out!